Cecily of York, Viscountess Welles (20 March 1469 – 24 August 1507) was an English princess and the third, but eventual second surviving, daughter of Edward IV, King of England and his queen consort Elizabeth Woodville, daughter of Richard Woodville, 1st Earl Rivers and Jacquetta of Luxembourg. She was First Lady of the Bedchamber to the queen in 1485-1487. Cecily was born in Westminster Palace, Ossulstone Hundred, Middlesex. (For centuries Westminster and the City of London were geographically quite distinct.) She was a younger sister of Elizabeth of York and Mary of York, and an older sister of Edward V of England; Margaret of York; Richard of Shrewsbury, 1st Duke of York; Anne of York; George Plantagenet, Duke of Bedford; Catherine of York; and Bridget of York. She was a niece of Richard III of England, senior sister-in-law of Henry VII of England, an aunt of Henry VIII of England, and a great-aunt of Edward VI of England, Mary I of England, and Elizabeth I of England. She was named after her paternal grandmother, Cecily Neville, Duchess of York. In 1474, Edward IV contracted a marriage alliance with James III of Scotland, whereby Cecily was betrothed to the future James IV of Scotland. Because of this she was for a time styled Princess of Scots. This agreement was, however, unpopular in the Kingdom of Scotland, and later military conflicts between Edward IV and James III negated the marriage arrangement. 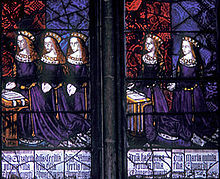 With her older sisters, Cecily was present at the wedding of their brother the Duke of York in 1478. In 1480, Cecily was named a Lady of the Garter, along with her next elder sister Mary. Edward IV continued to pay the Scottish dowry until 11 June 1482 when by the Treaty of Fotheringhay, Cecily was betrothed to Alexander Stewart, Duke of Albany, the exiled younger brother of James III, who had personal ambitions for the Scottish throne. Edward IV sent Albany and Richard, Duke of Gloucester with an army into Scotland. Richard returned with a bond from the merchants of Edinburgh to repay the dowry, and re-captured the town of Berwick upon Tweed. Edward IV decided to take the money and formally cancel the marriage with Prince James. Albany was killed on 7 August 1485, without a marriage to Cecily having taken place, but the death of Edward IV in 1483 had already changed the marriage prospects for his daughters in any case. After the death of Edward IV, his brother Richard, Duke of Gloucester, asserted his right to the crown despite the fact that Edward had two male heirs. One of the controversies of history has been the mystery of what happened to the two boys, but it is known that Richard, acting on information provided by Robert Stillington, Bishop of Bath and Wells, declared that his brother Edward's marriage to Elizabeth Woodville Grey had not been valid and that, therefore, their children were illegitimate and could not inherit the crown. Richard assumed the throne, and in January 1484 Parliament passed the Titulus Regius, declaring Gloucester to be King Richard III and barring the children of Edward IV from the throne. According to Philippe de Commines, diplomat at the court of the Charles the Bold, Duke of Burgundy, who was married to Margaret of York, an aunt of Cecily of York, only two of the elder daughters of Edward IV were declared illegitimate at the time that their younger brothers were excluded from the throne by the Act of Titulus Regius that confirmed Richard III's right to the throne. However, this was an error. The relevant line in the Titulus Regius says that "all th’issue and children of the said king [Edward IV] been bastards, and unable to inherite or to clayme anything by inheritance, by the lawe and custome of England." Cecily was married to Ralph Scrope of Upsall, a younger brother of Thomas Scrope, 6th Baron Scrope of Masham, and a supporter of Richard III, but the marriage was annulled on the accession of her future brother-in-law, Henry Tudor, as King Henry VII of England. Many published works fail to note this earlier, nullified, marriage. Years later, Cecily's discarded first husband succeeded another elder brother to the family barony, becoming Ralph Scrope, 9th Baron Scrope of Masham. He died circa 1515. The Lancastrian claimant, Henry Tudor, Earl of Richmond, had announced at Rennes, France that he intended to unite the rival royal houses of Lancaster and York, by marrying a daughter of Edward IV, and thus bring to an end the conflicts of generations of descendants of Edward III now known as the Wars of the Roses. His first choice was Elizabeth of York, the eldest of the late king's daughters, but had she died, Henry's marital intentions would have turned to Cecily herself, as he stated explicitly in his declaration. In 1487, after the accession of Henry VII and his marriage to her older sister Elizabeth, Cecily was married to a staunch Lancastrian nobleman, John Welles, 1st Viscount Welles, the son of Lionel Welles, 6th Lord Welles and Margaret Beauchamp of Bletso. Her new husband was a maternal half-brother of Lady Margaret Beaufort, and thus an uncle of the half-blood of Henry VII, and a royal favourite by both politics and blood. Also I geve and bequethe to my dere beloved lady and wife Cecille, for terme of her lif, all my castelles, manors, landes and tenements, aswell suche as I have purchased as all odre during only her life, whome I trust above all oder, that if my goodes and catallis wilnot suffice for the performance of this my laste will, that she will thenne of the revenues of the profittes of my inheritance perform this my laste will. Also I will that a preste be founde for ever after my said wifes decease to sey masse daily for my sowle and all Cristen sowles at the said aulter of the yerely revenues of my purchased landes, and oder which my saide lady hath promised me faithfully to purchase to the same entent if my saide purchased landes suffice not therto. And I will yt suche residue as shall fortune to be of my goodes that my saide dere beloved lady and wife have theym to her owne use. And I make executors the saide Cecill, my dere beloved wife, and Sr Raynold Bray, knyght. . .
Cecily played a role in various major royal ceremonies during the earlier years of Henry VII's reign, as befitted her position in the Royal Family, as sister of a queen consort and sister-in-law of a king regnant. She carried her nephew Arthur, Prince of Wales, at his christening; attended her sister Elizabeth of York at her coronation as queen consort; and bore the train of Catherine of Aragon at her wedding to Prince Arthur. There is also a record of her lending money to her sister, the queen, in 1502. Though the king banned Cecily from court after her third marriage to Thomas Kyne, a man of low degree, she found comfort in the assistance of Margaret Beaufort, Countess of Richmond (Henry's mother). Despite her apparent mourning, some three years into her first widowhood, and having lost two of the children by her late husband, she contracted a marriage which has been described as being "rather for comfort than credit" (see Fuller's Worthies, vol. 2, p. 165). Cecily's third and final marriage, to Thomas Kyme, Kymbe, or Keme, an obscure Lincolnshire squire, otherwise called Sir John Keme or Kene, of the Isle of Wight, took place sometime between May 1502 and January 1504. It is thought to have been a love match, entered into entirely from the princess' own liking. Green states that she chose a partner to suit herself who was also someone so unthreatening as to be beneath the notice of the king or likely to arouse his jealousy. This wedding took place without the king's approval or permission. The princess appears to have miscalculated her brother-in-law's attitude. The king banished Cecily from court and all her estates were confiscated. After the intervention of the king's mother, Lady Margaret Beaufort, who is known to have aided Cecily when she fell out of favour with the king, some of Cecily’s lands were restored. She was to enjoy only a lifetime interest in those remaining to her, and to have nothing to pass on to her husband, or to any children of their union. Cecily lived out the balance of her life quietly, far from court. In the royal account books, there is a gap in the record of her final years. Existing details about her final years in this last marriage are scanty and conflicting. Two children, Richard and Margaret (or Margery) are mentioned in the enhanced copy, dated 1602, of the heraldic Visitation of Hampshire (1576) made by Smythe, Rouge Dragon Pursuivant at the College of Arms, indicating that they lived, married, and had offspring. The children of the princess and her last husband were granted no royal titles or styles, nor did they enjoy any royal favours, lands, or positions at court, nor, indeed, any public recognition whatsoever. Over the centuries any memory of them has been obscured, and thus the veracity of their historical existence is now difficult to substantiate. Princess Cecily died in 1507, at the age of 38, only a few years after contracting her last marriage. She lived at East Standen in the Isle of Wight, not in great wealth. According to Edward Hall's Chronicle, she was buried in relative obscurity in Quarr Abbey, Isle of Wight. Horrox disputes this pointing to evidence from the Beaufort account books that states she died at Hatfield, Hertfordshire, after a three-week sojourn there, and was buried at a place that must have been local, known as "the friars" (perhaps the friary at Kings Langley, associated with the House of York and where Edmund of Langley, 1st Duke of York was buried). The writ of diem clausit extremum, which supplies her death date, styles her as "late wife of John, late Viscount Wells", omitting any reference to her last husband or their children. If she was indeed buried in the precincts of Quarr Abbey, near her last home, then Cecily's tomb and any record of its precise location was lost when Quarr Abbey was destroyed during Henry VIII's dissolution of the monasteries. Quarr's building materials were reused. A stained glass portrait of Cecily, originally from a larger "royal window" depicting Edward IV's family, is now in Glasgow's Burrell Collection. A modern copy has been placed in the much restored original group in the north transept of Canterbury Cathedral. These are, along with another window in the parish church of Little Malvern, Worcestershire, her only surviving memorials. ^ Macdougall, Norman, James III, John Donald (1982), pp. 116–7. ^ Kendall, Paul Murray (1955). Richard the Third. London: George Allen and Unwin. pp. 215–220. ISBN 978-0393007855. ^ "Titulus Regius". The Richard III Society. Retrieved 21 Aug 2016. ^ Fisher, George (1832). A Companion and Key to English History. London. p. 181. Retrieved 21 Aug 2016. ^ Champion, Sharon. "Appendix I: Will of John, Lord Welles. In 'Not So Fortunate As Fair': The Life of Princess Cecily Plantagenet". Isle of Wight History. Retrieved 21 Aug 2016. ^ Nicolas, Nicholas Harris (1830). Privy Purse Expenses of Elizabeth of York. London. p. xxi. Retrieved 21 Aug 2016. ^ Weir, Alison (2013). Elizabeth of York: A Tudor Queen and Her World. New York: Ballantine. p. 410. ISBN 9780345521361. ^ Weir. Elizabeth of York. p. 410. Macdougall, Norman, James III, A Political Study, John Donald (1982), for the Scottish marriage plans.